There are 5 shops proposing this game for download at an average price of $ 14.33. We found the best promotion ongoing with a discount of 15%. If you're into your turn-based strategy games like Laser Squad or X-Com, or military sims like Hidden & Dangerous, then Breach & Clear will be right up your alley. It is a port from a mobile game, which occasionally shows, but it's got enough depth and real world elements to make it worth checking out for some brief bursts of fun. The game lacks any real overarching narrative and instead focuses on setting up the player with a series of semi-realistic scenarios where they get to pit a squad of elite soldiers against increasingly challenging bad guys and charging them with duffing them up in tactical fashion. You can pick your troops from a set of real life special forces units, including Spetsnaz, SAS, and the Army Rangers, and you then get to kit them out from an exhaustive set of combat gear and weapons. 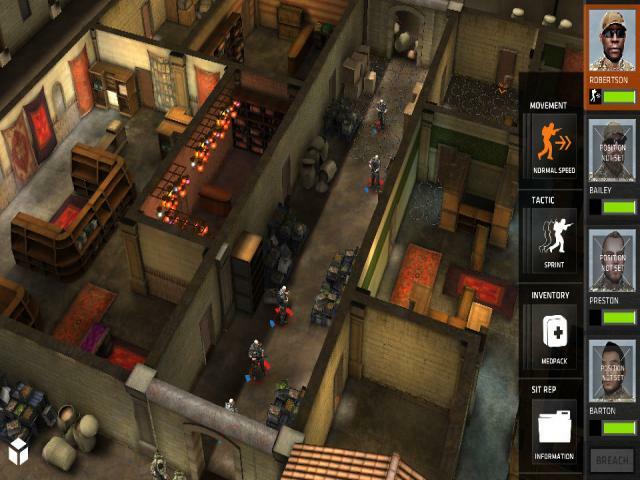 The game plays out in turn-based fashion (although the player and their opponent carry out their actions at the same time) and gives you some pretty tough and very realistic terrorist-style situations to try your hand at, and you really need to think through every move if you want to win. Tactics are everything, and each soldier counts for victory. Breach & Clear is pretty deep for such a game and offers armchair strategists plenty to get their teeth into. The lack of basic control options hints at the game's mobile roots, but the wealth of customization makes up for this. The visuals are largely static, but still nice enough to look at, while the combat is challenging and enjoyable. It's not a game you're going to play for a long time, but for small bursts, it's perfect.